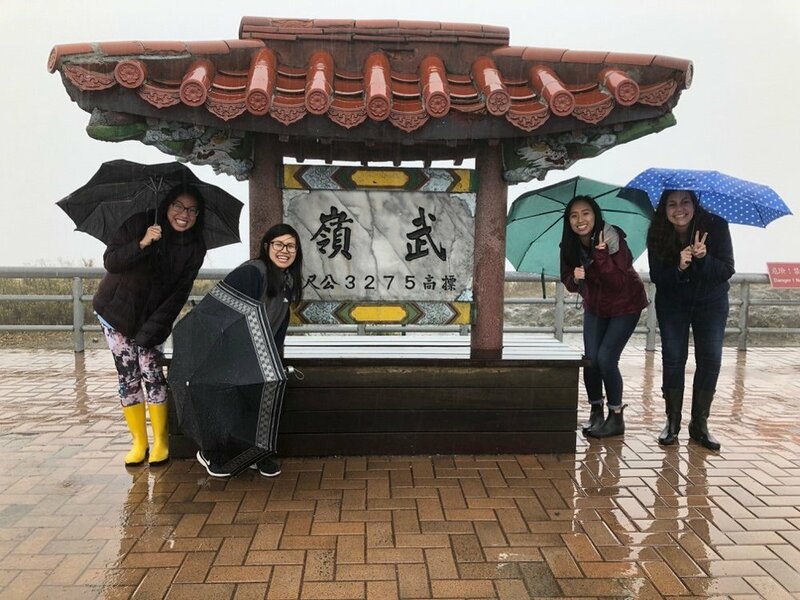 Over April 1 to 3, ten of the Taichung ETAs traveled five hours into the mountains to host remote English Camps at two elementary schools: Lishan Elementary School (梨山國小) and Ping Deng Elementary School (平等國小). We were joined by our coordinator Iris; four Fulbright TEFL advisors (Alicia, Dominique, Kevvy, and Yuta); Fulbright Scholar Dr. Agnes Tang; Dean Min and LET Iris from Shang Shih Elementary School; and a representative from the Education Bureau of Taichung City. The first day was primarily spent traveling to Lishan through Nantou County. We made stops around Cing Jing Farm and Hehuanshan National Forest Area. One of the notable stops was Wuling (武嶺) which, at 3275 meters, is the highest point in the Taiwanese highway system. Unfortunately, we didn’t see much beyond the rain and fog, but we did get to experience the crisp 4-5°C (40°F) temperature. It was certainly the coldest I’ve felt while in Taiwan this year (I will also admit I was not dressed properly for the weather). 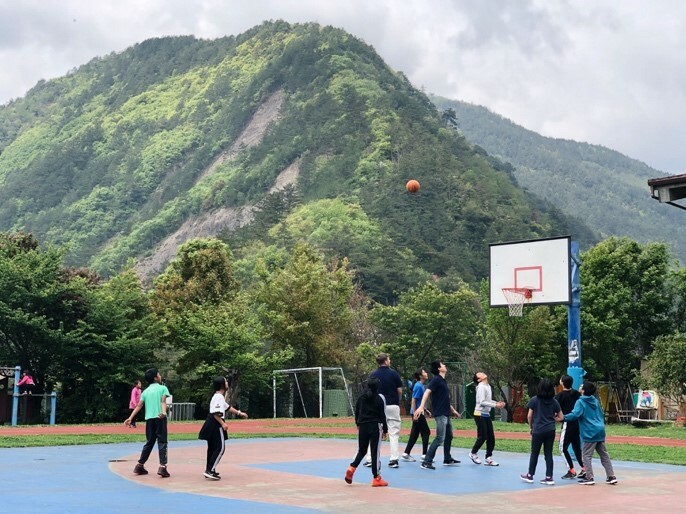 We hosted camp at Li Shan Elementary School on the second day. It proudly holds the title as highest school in all of Taichung at an impressive 2016 meters in elevation. There are 104 students in the elementary school with a range of 11 to 22 students per grade. A corridor connecting two school buildings overlooks the luscious mountains and sweeping farmland. It’s really a sight to behold. The ten of us were divided into three groups, each tackling a set of two grades (1-2, 3-4, and 5-6). Seven Taichung ETAs already teach English camps at different elementary schools around the city, so we simply modified and brought their Pokémon and camping themed camps to Lishan. With games like charades, I Spy, and four corners, first through fourth graders had no trouble identifying colors, animals, and ecosystems animals live in. Fifth and sixth graders got a taste the American outdoors by putting together their own s’mores using graham crackers, marshmallows, and chocolate and learning words like “tent”, “backpack”, and “hike”. On our last day, we had camp at Ping Deng Elementary School, which has an even smaller student population with only 37 students. The smallest class size was first grade with just two students! Given their small size, I could feel that the Ping Deng community was incredibly close knit and the students were beyond excited to have us there. We especially bonded with students during the break time, as they pulled us in to play basketball and run relay races around the track. Don’t underestimate them just because they’re younger and shorter! They definitely kicked our butts at shooting hoops and running laps. Both schools are home to large percentages of students of aboriginal backgrounds, primarily the Atayal people. After English camp on the second day, we were invited to visit the Lishan Culture Museum. I was incredibly grateful for the time to learn about the many traditions of the Atayal people and the history of the region, including the development of the Central Cross-Island Highway and the area’s natural ecosystems. On the second floor of the museum, we toured displays of tools, cloths, and life cultures of the Atayal people, providing insight into their fishing, hunting, and weaving traditions. 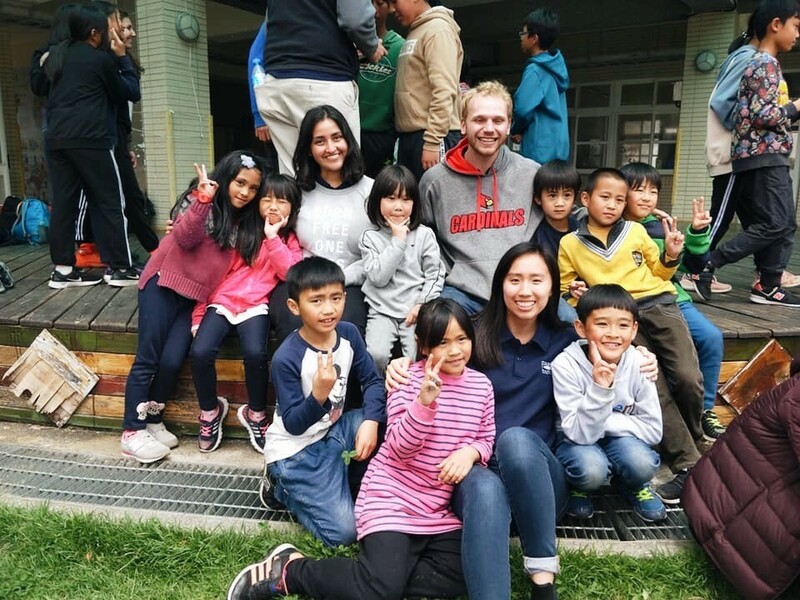 While we were only with the students at Li Shan and Ping Deng Elementary Schools for only a few short hours, they left quite the impression on us and it was certainly hard to part ways at the end of the day. It was a very fulfilling few days of cultural exchange and I believe both the students and ETAs were able to take away many different things from the experience. Thank you for your warm hospitality, Li Shan and Ping Deng Elementary Schools!